This happy group of now close friends share the same minds and hopes. 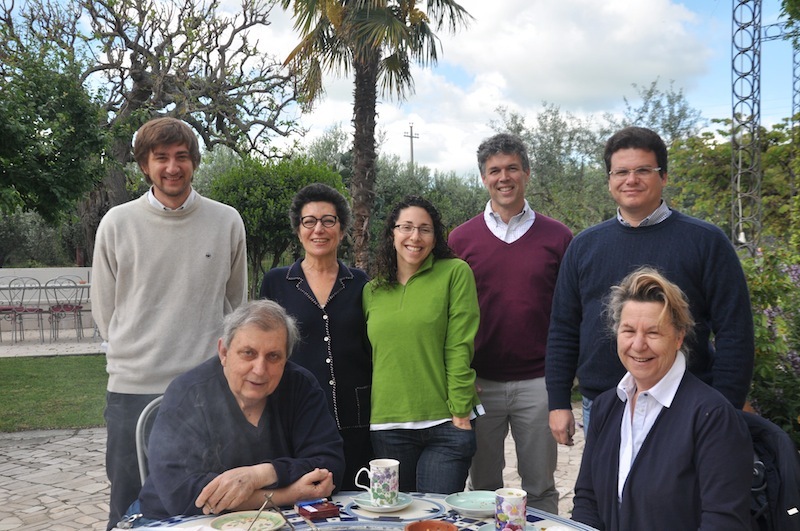 From left: standing: Pietro Hausmann (former Gustiamo, now Coldiretti – Campagna Amica – ie, when you meet Gustiamo you stay friends and connected forever); Beatrice and Danielle (Gustiamo); Tom Mueller (no need of presentation and so great to have finally met him in person! ); Alberto Grimelli (Teatro Naturale, the Italian online magazine about olive oil and much much more). Sitting, our big friend, Nicola Bovoli and Lucia, his wife (I am told friends call her Santa Lucia!) who make Vicopisano EV Olive Oil extraordinaire in Toscana, near Pisa. We are having breakfast. Later, in the afternoon, we’ll drive to the small town, San Martino in Pensilis, to attend the Extrascape “un-convention”, the revolutionary new olive oil competition (more on this, later). We are all happy guests of Marina Colonna, in her estate near San Martino in Pensilis. Marina took us for a ride in her beat up truck to see her property (check out the video clip below). I thought it would be a 5 minute drive but it took hours – I thought we were covering the whole region of Molise. 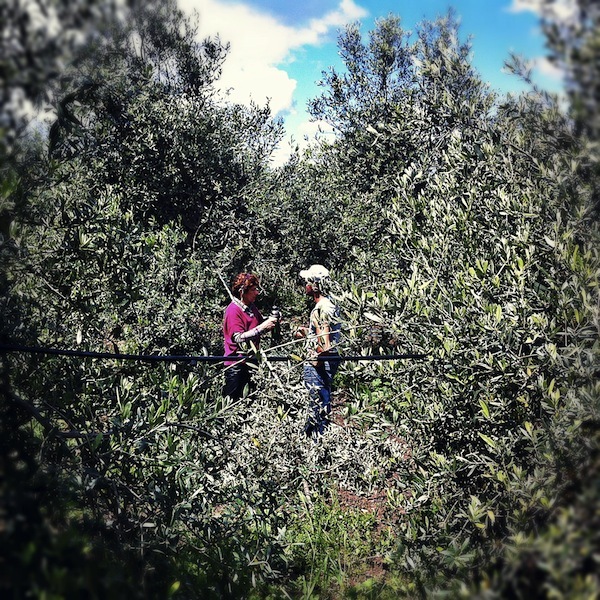 It’s 180 hectares of beautiful land, 55 of which are olive groves with 15 different cultivars, the usual ones but also local Gentile di Larino, Rosciola di Rotello, and Sperone di Gallo. Don’t olive cultivars have such beautiful names? She knows every single tree, in fact, she talks with such affection of them, it seems like she talks TO them and you’d think they are all her creatures. Her workers were all over, pruning the trees and doing other farming activities. She talks to them with authority and gives clear directions. At the same time, she carefully listens to their suggestions and ideas. Her warmth and affection is very visible. She even brings them hot coffee every day, when she does her rounds. When we heard we would be Marina’s guests, we googled her. She is the descendant of the ancient Colonna family from Rome. Her ancestors were popes, cardinals, governors, mayors… In the car, before arriving to Marina’s, Pietro suggested we should address her “Your Highness”; Danielle said “Eccellenza” would do; I said that perhaps a little bow, when introduced, would be enough. But instead, Marina is the most down to earth person we’ve ever met; she is funny, opinionated, speaks her mind and is a lot of fun to be with. She bakes a fantastic pie with EVOO (her own, of course), which we had for breakfast. Marina is one of the most hospitable people I’ve ever met and I can’t wait to go back in her beautiful home. 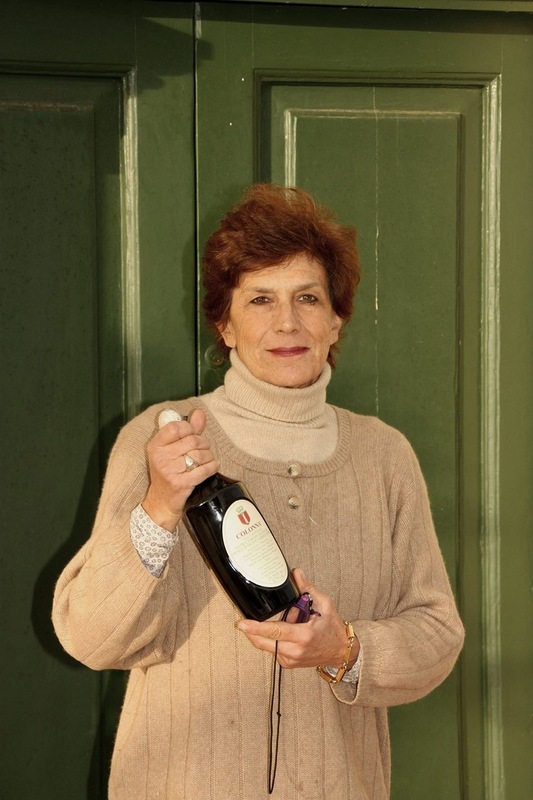 Marina Colonna’s EVOO won, not one, but two (!) awards at Extrascape, including the Gran Premio Extrascape, which is the equivalent of the “Best Picture” for the Academy Awards. After having spent a whole glorious day with her on her property, we can’t tell you how happy we are. Best Extra Virgin Olive Oil and Best Landscape. No award was better deserved. Marina is very proud because she really believes in what she does, she cares about her land and her people. The award is for them, too.